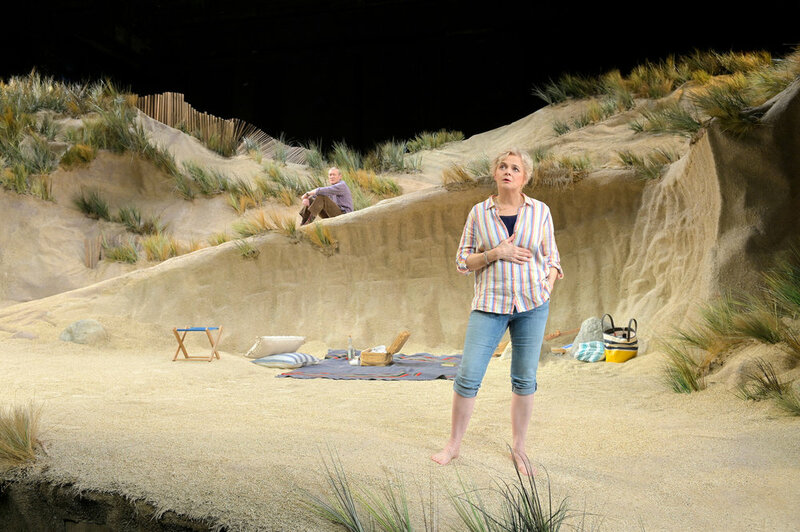 In her program notes about Edward Albee’s Seascape, director Pam MacKinnon — who has directed 11 productions of seven of Albee’s plays over the last decade and a half — says that she sees this play as “more comedy than tragedy,” and perhaps the most “unambiguously hopeful” of all of his work. It won the Pulitzer Prize for Drama in 1975, the year of its Broadway debut, and yet this isn’t a play that gets as much attention or has had as many revivals as Albee’s bigger hits like Who’s Afraid of Virginia Woolf, A Delicate Balance, and Three Tall Women. Seascape shares much of its DNA with the former two of those plays, particularly in its structure and four-person cast, and yet it is certainly Albee at his most surreal, playful, and metaphorical. The action opens with an older couple on the beach. Nancy (Ellen McLaughlin) paces and breathes in the scene, her easel standing to one side where she has just completed a small depiction of it. (The set, designed by David Zinn, is masterful in its towering, sandy realism.) Charlie (James Carpenter) naps on a beach blanket with the remnants of picnic beside him. Their easy, repetitive dialogue is pure Albee — warm and empathetic in its depiction of a long marriage, at moments high-minded and quirky in its beats. Nancy has dreams of traveling the world from beach to beach, now that they can, and Charlie has given up on such dreams and knows his wife too well — it sounds nice, but she’d hate it before long. It is a conversation anyone whose parents have stayed together a long time will find comfortingly familiar, and frustrating. But within the tedium of their daily bickering lay keys to their individual psyches, and big questions about how one should live their life. Are we meant always to keep living, to move on, to evolve to the very end? Or do we become who we become, and the rest is just gravy and naps on the beach? If that were all there was to this play, it never would have achieved the acclaim it did, so now for the spoiler that won’t be a spoiler for students of Albee and his absurdist idol Samuel Beckett: Another couple appears over the dunes, and sets about shaking up this otherwise simple play. And this couple is not a human one, they’re lizards. Though their species is never spelled out, Leslie (Seann Gallagher) and Sarah (Sarah Nina Hayon) are of some evolving species of amphibious creature who only recently decided to emerge from the water and look around on land. They look down on fish as stupid and inferior, they have many hundreds of offspring at a time, and they don’t give a lot of thought to emotions. They do, however, speak in articulate English, and Albee tries his level best not to let this devolve into a Star Trek episode or other science fiction trope where the humans try to explain to the aliens how stuff works on earth. No, it’s far more poetic than that, and less heavy-handed, because Albee is masterful with his light touch. MacKinnon, too, has directed a strong cast of actors with great subtlety and wit — even bubbling up and critiquing, where she can, the subtle sexism that sneaks into this 44-year-old text, through intonation. So a couple of late-middle-aged white folks bump into a couple of lizards on the beach, and it doesn’t lead to any predictable punchlines. In fact, it leads to a sense of wonder about the human condition, and the purpose of existence. And of course there’s still plenty to laugh at there. Seascape plays through February 17 at ACT’s Geary Theater. Find discounted tickets on RushTix.